More tiresome than entertaining, especially with mind-numbing CGI exhaustion setting in early. 109 min. Walt Disney Pictures, Walt Disney Studios Distribution. Director: Tim Burton. Cast: Johnny Depp, Mia Wasikowska, Helena Bonham Carter, Anne Hathaway, Crispin Glover. As we know all too well by now, the pernicious next step from Hollywood’s culture of sequels has been a culture dominated by remakes and “reboots” and “reimaginings.” This commercial imperative has made stylists like Tim Burton very much in demand to bring fresh perspectives to shopworn stories. 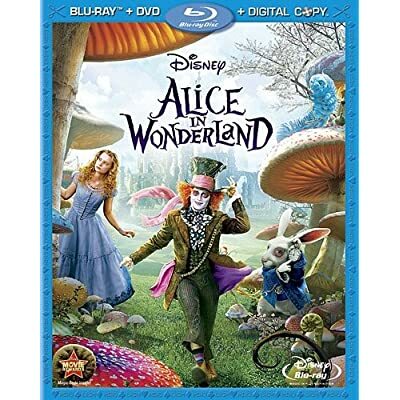 So when Disney decided to dust off Alice in Wonderland for another go—recognizing the concept has been done to death in every medium—the studio opted for a 3D romp, Burton-style. It couldn’t have been too hard a sell: mega-bucks to burn and choice, tailor-made parts for Burton’s two most frequent screen partners: Johnny Depp and Helena Bonham Carter (also Burton’s offscreen life partner). But despite Depp’s Mad Hatter and Carter’s Red Queen, the “inspiration” on display feels, well, “old hat.” Here again are the gnarled trees, blasted landscapes, and coterie of weird characters, except more garish and lacking in the narrative vitality needed to complement the design. Too much of this Alice in Wonderland flies on autopilot, turbulence and all, to an ill-at-ease destination (this Alice faces a capitalist fate that leaves an unpleasant aftertaste). Screenwriter Linda Woolverton (Beauty and the Beast) takes a similar approach to Hook, Steven Spielberg’s revisit of Peter Pan: a time jump and convenient amnesia allow an older hero—in this case Mia Wasikowska’s nineteen-year-old Alice—to rediscover the childhood adventures depicted in Lewis Carroll’s Alice’s Adventures in Wonderland and Through the Looking-Glass. This young-adult Alice is a runaway bride of sorts, taking “a moment” away from the marriage proposal of a Victorian prig; in short order, she tumbles down the ol’ rabbit hole (the film’s one notably effective 3D sequence). In the chamber below, she reenacts Carroll’s pre-feminist puzzle of body consciousness to gain entry into Wonderland. Thus begins an unconvincing mashup of The Wizard of Oz and, oh, let’s say Beetle Juice. Depp’s carrot-topped, Kabuki-faced Mad Hatter is a partly effective, insane but sweet stand-in for the Scarecrow (Alice will miss the Mad Hatter most of all, don’cha know), while the Red Queen and White Queen (Anne Hathaway) have a Wicked Witch of the West, Good Witch of the North thing going on. It doesn’t help that Hathaway charmlessly acts as if lost in a druggy haze, and that the literary Alice’s defining characteristic, her precocious impertinence, becomes somewhat lost in Wasikowska’s sleepy translation. Woolverton replaces the quaint charm of Carroll’s set pieces with a flop-sweat plot built around the “Jabberwocky” poem from Through the Looking-Glass. A magic parchment known as the “Oraculum” lays out Wonderland’s day-at-a-time destiny, predicting “the frabjous day” when Alice will assume the “vorpal sword” and slay the Red Queen’s agent of destruction, the Jabberwock. It’s a (rote) journey to self-discovery of a throw-down woman-warrior role, complete with suit of armor. It’s all more tiresome than entertaining, especially with mind-numbing CGI exhaustion setting in early. Only one element consistently fires on all cylinders: the spot-on Red Queen. Carter has a grand old time emotionally abusing everyone in her path and, of course, ordering beheadings. In the film’s most artful use of digital effects, Carter’s head balloons into a wide-angle without the lens; her noggin is the one part of the film you’ll be glad to find overblown. 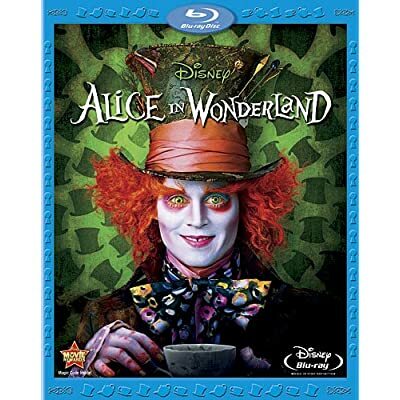 Disney serves up one of the year's biggest hits in a 3-Disc Blu-ray + DVD + Digital Copy Combo Pack edition. The Blu-ray hi-def transfer is spectacular, reference-quality stuff, razor-sharp in its clarity and detail, nicely textured, and spot on in color and contrast with nice, deep blacks. The amazing image is backed by an equally impressive, state-of-the-art DTS-HD Master Audio 6.1 mix that maximizes surround capabilities and delivers robust music and effects that never overwhelm the dialogue. The bonus features are a bit disappointing, truth be told. Director Tim Burton doesn't provide a commentary, and there are no galleries of production design art. Instead we get two decent if perfunctory featurettes. 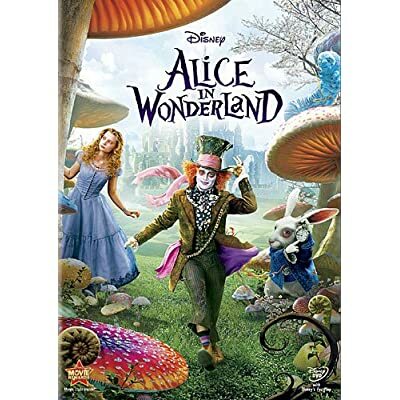 The first is "Wonderland Characters" (27:56, HD with "Play All" option), subdivided into "Finding Alice," "The Mad Hatter," "The Futterwacken," "The Red Queen," "Time-Lapse: Sculpting the Red Queen" (the make-up process with commentary) and "The White Queen." Participants include Burton, Helena Bonham Carter, Johnny Depp, Mia Wasikowska, Anne Hathaway, Mairi Ella Challen, costume designer Colleen Atwood, makeup artist Joel Harlow, visual effects supervisor Carey Villegas, makeup artist Patty York, associate producer Derek Frey, dancer David "Elsewhere" bernal, makeup designer Valli O'Reilly, makeup and hair designer Paul Gooch, property master Doug Harlocker, producer Joe Roth, Matt Lucas, screenwriter Linda Woolverton, director of photography Dariusz Wolski and producer Richard D. Zanuck. Learn at last the secrets behind Depp's alternating accent as the Mad Hatter and the terrifying dance the Hatter performs (but not Depp—he was doubled!). The second featurette is "Making Wonderland" (19:29, HD with "Play All" option), divided into "Scoring Wonderland," "Effecting Wonderland," "Stunts of Wonderland," "Making the Proper Size," "Cakes of Wonderland" and "Tea Party Props." Joining Burton, Carter, Depp, Wasikowska, Villegas, Frey and Harlocker are composer Danny Elfman, co-producer Tom Peitzman, senior visual effects supervisor Keb Ralston, Crispin Glover, visual effects supervisor Sean Phillips, CG supervisor Kee-Suk Ken Hahn, animation supervisor David Schaub, character designer/illustrator Michael Kutsche, stunt coordinator Garrett Warren, art director Andrew L. Jones, cake designers Joan Spitler and Leigh Grode, production designer Robert Stromberg and set decorator Karen O'Hara. The best of set here is a glimpse at how Carter, Depp, and Glover's performances were computer enhanced. Of course, the presence on a second disc of a DVD copy and on a third disc of a Digital Copy add value to this edition, though separate Blu-ray and DVD editions are also available. All site content © 2000-2019 Peter Canavese. Page generated at 04/18/2019 03:00:52AM.